It may not tune your guitar any better than your current tuner, but we still absolutely love this thing. After spreading holiday cheer throughout the streets of New York City last year, D'Addario's resident Santa takes London Town. The company's newest guitar strap and pick collection features art from the iconic animated film. A fascinating video that might give you pause the next time you're absentmindedly strumming the strings on your guitar. 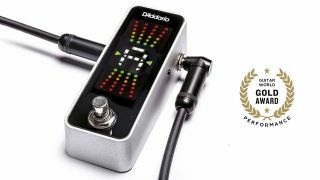 D’Addario has launched a series of new products at the Summer NAMM Show in Nashville, including a new Chromatic Pedal Tuner. D’Addario has welcomed Texas guitar legend Eric Johnson to its fretted arist family. At the 2016 Summer NAMM show in Nashville, D’Angelico Guitars announced the launch of its new electric guitar strings: D’Angelico Electrozinc. Last Thursday night, GRAMMY nominated producer, songwriter and guitarist Blake Mills led an all-star cast of musicians for a special night of music that raised $160,000 in support of music education. D’Addario Accessories has announced the launch of its Eclipse Tuners, the newest set of tuners being introduced to the company’s line of tuning accessories. D’Addario Accessories is excited to announce the launch of the Ukulele Humidifier Pro, as part of their line of humidity control products. D'Addario has announced the extension of Nickel Bronze, their brand-new premium uncoated acoustic string line, now available in two additional sets and a full line of singles. At the 2016 Summer NAMM show in Nashville, D’Angelico Guitars has announced the launch of their all-new electric guitar strings: D’Angelico Electrozinc.